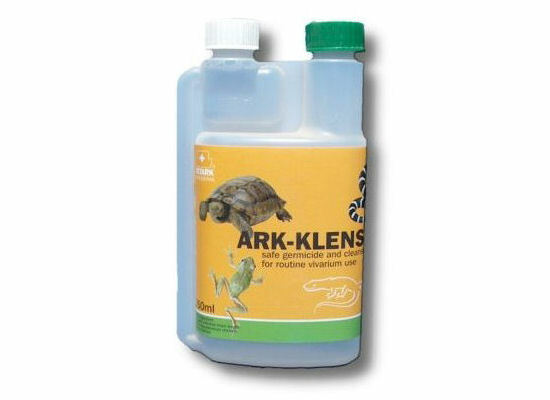 Ark Klens Disinfectant & Cleaner CONCENTRATED BULK 1 litre | Livefood UK Ltd. This is a blend of benzalkonium chloride (quaternary ammonium compounds) specially selected for safety of use. This family of chemicals are powerful disinfectants with an additional detergent and deodorising action. At the recommended concentrations ARK-KLENS is non-corrosive, it is bactericidal against a wide range of gram negative and gram positive bacteria. Some viruses and some fungi are also susceptible. This makes ARK-KLENS suitable for disinfection of the animal "environment" such as vivaria, cages, kennels, and food and water bowls etc. It can also be used safely as a disinfectant for incubators. As a disinfectant it has broad antibacterial activity and is virucidal against lipophilic viruses. General disinfection is carried out using 10ml/5 litres ie. a final concentration of 0.025%.